Selecting a building plot is the most important decision a future builder will have to make, and therefore it is necessary to pay appropriate attention at this step. You have to be aware that not only are you just choosing the land but also the place where you will be living for the rest of your life. First, you have to be clear what single-family house you want to build on it. Then you have to scout out suitable locations in regard to commuting to work, the school your children will be attending, after school activities, sports practice, accessibility to public transportation, availability of services, shops, health services, etc. The smallest construction parcels run between 300 - 400 m2 and are intended mainly for semi-detached houses. The minimum width of such a parcel, allowing for substantial disposition of the future family house, is 6.5 m, with the house being laid out over the entire width of the parcel. Medium-sized parcels range between 400 - 800 m2 and these are suitable for constructing smaller, free-standing houses or duplexes. The minimal width of such a parcel is 16m. In general, you can simply use this formula for the width of the building parcel: width of the house you are considering + 3 meters on each side. Large parcels around 1.000 m2 and more correspond to construction of bigger or multi-generation single-family houses with a rich backdrop of recreational space that includes pools, flower gardens or a tennis court. As the size of a construction plot increases, not just the price rises but also maintenance demands. Therefore, it makes sense to consider the size of the building parcel not only from the financial point of view but also in terms of the time required to do the necessary maintenance. When selecting a construction plot, the shape of the ground also plays a significant role. The most suitable lot is a rectangular one with a ratio of 2:3, where one of the shorter sides is oriented toward the access road. Not an aspect to neglect is how the construction plot is oriented in the cardinal directions. In this case, the ideal connection is a road coming from the north, allowing the sun from the south to optimally light most of the rooms. With rapid global warming today, where 32 -35o C temperatures are not unusual at the geographic latitudes where the Czech and Slovak Republics lie, more and more we are encountering people who prefer the rooms to be oriented to the east or west. When you consider a brick house can last 100-200 years, it is something worth thinking about. Another aspect in selecting land is how steep it is, which plays a significant role in regard to future financial demands. Flat and moderately steep lots are ideal for laying a foundation. Steep properties need to be adjusted and having to build complicated support walls, terraces and a basement under the entire house may unreasonably overprice the whole building. Once all the specifications have been clarified regarding the land and the price you are willing to pay for it, a search can begin. We recommend spending more time following classified ads: offers advertised by ordinary people, real estate agencies and developers; and offers published in advertising magazines or on the Internet, for example on www.reality.sk , www.reality.zoznam.sk , www.trh.sk and www.real.sk . Over several months, you will get “a picture” of what is being offered and at which locations and prices. We definitely recommend you purchase a construction plot through a real estate agency and not through any intermediaries, where you can be paying for the ground without buying it. Don’t be taken in by incredibly advantageous offers where a deposit has to be put down that day. 99.99% of the time, a fraud is being perpetrated. If you purchase land advertised by an individual or a reliably-run real estate agency, we recommend you look for yourself at the declared features of the land and especially the actual owner. Find the title deed at the cadastre office (the best time is the day the purchase contract is signed) and look for any encumbrances, easements and preemptive rights. OOrient yourself rather toward reliable real estate agencies which have (or at least should have) discovered all information about the land regarding construction, ownership and infrastructure. A reliable real estate agency can be recognized by positive references, the length of time the agency has been operating in the market and whether it is a member of the National Association of Real Estate Offices in Slovakia (NARKS for Národná asociácia realitných kancelárií Slovenska), which checks compliance with rules agreed by its members. Contacts for NARKS members can be found on its website, www.narks-real.sk. Another option for buying a construction plot is to purchase it from a development company who focuses on construction projects in certain localities. Compared to the disadvantage of mass construction, such a developer provides, in an overwhelming majority of cases, a networking advantage, saving not a small amount of worry over many irresolvable problems. Be careful of development companies which offer very favorable land, but reserve the right to construct single-family houses under hazy and opaque conditions. It is likely enough that such property will not have such advantages in the end, but indeed will become something quite different. The main factor influencing the price of a construction plot is whether the building can be connected to public utilities with sufficient capacity, particularly electricity, and also gas, water and sewer lines, rainwater canalization, cable television and telephone, based on local conditions. The most important utilities are electricity and gas. Water can generally be obtained by drilling a well, while wastewater can be discharged into an insulated catch basin. 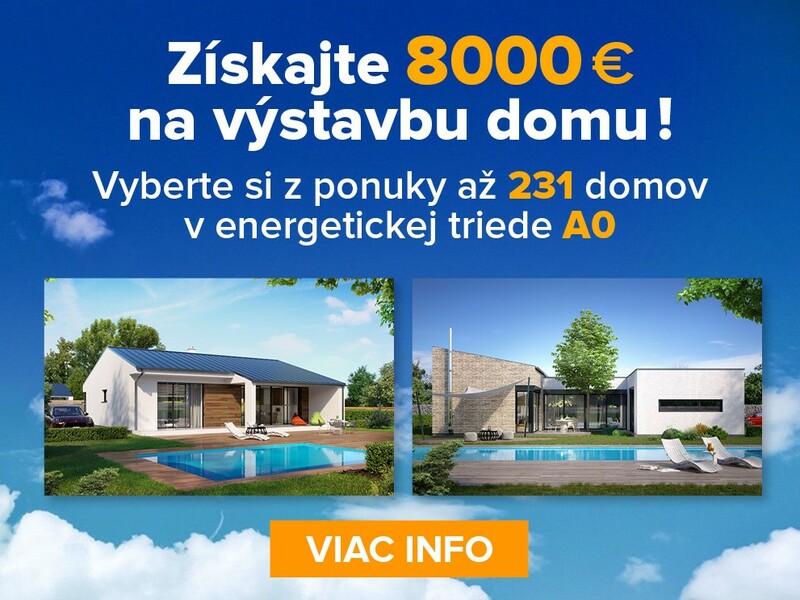 Many times in advertisements, a stated “VIS” (všetky inžinierske siete - Engl. all utility networks) does not have to meet your expectations. Written agreements for a drafted construction project to be connected to utilities have to be obtained from all utility network administrators. It has happened that the transmission lines are running in front of the parcel, but approval would never be given to connect because there is no longer any sufficient capacity and you will have to handle the connection yourself using your own 200 – 300 meter extension or, even worse, build a transformer station at your own expense! Before seeking a connection to utility networks, you should make sure the plot is defined as a construction plot according to the definition in the Construction Act, meaning whether it will be absolutely possible to build anything there at all and under what conditions or restrictions. Not every piece of land is automatically a construction plot and unless you review all the data thoroughly yourself, it may happen to you that you will become the owner of the masterfully most expensive garden in the greater vicinity. If you have any doubts about the ability to build a family house according to your ideas or you see any utility network as problematical, we recommend you enter into an agreement on a future contract to purchase the land, with a provision that the plot will be purchased only after a land use decision has been issued. To have a land use decision issued, the applicant does not necessarily have to be the owner of the property; the owner’s approval is enough. The issue of a land use decision to allow a building to be placed on the property will be the starting point for concluding the purchase contract. The initial step has to be taken with the building commission, whose role has been carried out since 1 January 2003 by city, local and municipal offices. There you will be informed about the municipality’s land-use plan and related regulations, which reveal whether the construction of a single-family house on the property you are going to buy will be possible and under what conditions. When you reach this point, we recommend you get information about the construction being planned in the vicinity so it would not happen to you that in 5 years your family house will be in the center of a housing estate. Any building on property with no utility network connections available may overprice construction significantly. This amount may even reach 26.55 €/ m2 to 33.19 €/ m2 (800 to 1,000 SKK/m2), therefore the price for such land should be reduced by this amount. Unfortunately, we often encounter sellers who somehow forget this fact. Another, very important factor in purchasing a construction plot is the ability to have access to a public road. And finally, for contented and quiet sleep, we recommend you conduct a geological survey and radon testing. Construction done on the site of a former dump or digging a basement below the groundwater level may unexpectedly increase the financial demands of the construction itself. Before purchasing a construction plot, never feel bad about the time and cost being expended to ascertain any circumstances that could unreasonably increase construction costs or not allow the planned construction to take place. This section familiarizes you with how to proceed in arranging a construction permit for building a single-family house. Even though we recommend you leave this, unfortunately, very challenging procedure to the professionals who work with our partners, we will try to clarify in the next paragraphs the stages you should follow and how you should proceed in this not very simple process. Construction permits to build a single-family house are issued by the building commission, whose functions have been conducted since 1 January 2003 by city and municipal offices. The applicable administrative law for building commissions is the Construction Act No. 50/1976 Coll., amended by Act No. 237/2000 Coll., which has been in force since 1 August 2000. This has brought some positive changes simplifying the process and, when constructing simple buildings, there is an option to merge the land-use and construction proceedings. Single-family houses usually fall under the category of simple buildings. Land-use and construction permit proceedings can be merged into a single process in a case where conditions for locating the structure are explicit in regard to relationships in the area, meaning that you are going to be building on land which was in the municipality’s land use plan (zoning ordinance) approved for individual home construction. In such a case, the home builder can immediately submit a request to merge land-use and construction permit proceedings. The application form must include the home owner’s first name, last name and address; construction site; dates when construction is expected to begin and end; the number of parcels; type of plots; a list of the persons participating in construction permit proceedings and their addresses; title deeds and any other records documenting rights to the construction plot in question; a layout drawing marking out the building and drawn connections to utility networks which have been beforehand negotiated with and approved by the administrators. It is also necessary to attach three counterparts of the complete design documentation which have been prepared by a licensed designer. In addition to the above documents, a statement from the construction supervisor also has to be attached stating that he or she will be supervising the construction as a technical expert. After the application form and the supplied attachments are examined, the building commission will inform the applicable government authorities and all known participants about proceedings to grant a construction permit and when such proceedings will begin. The people participating in construction permit proceedings are the applicant (the home builder) and any other individuals or legal entities whose title or other rights to the land or buildings on it may be affected by the proposed construction. A municipality in whose cadastral territory construction is being proposed also participates in construction permit proceedings. Since the Construction Act was amended by Act No. 237/2000 Coll., the design engineer who produced the building’s design documentation also participates in construction permit proceedings. Unless any of the participants in construction permit proceedings objects to the proposed construction, the building commission will issue the construction permit. Once the construction permit enters into legal force, the home builder can begin constructing the single-family house. Obtaining and arranging all the required supporting documents to have a construction permit issued may last 1-3 months (and even longer) – due to the demands of such a process –and such a period should be considered when planning the start of construction. The completed building can only be properly used after a “certificate of occupancy” has been issued, which can be done by the same building commission that issued the construction permit. An “Occupancy Inspection” is organized by the municipal building commission on the basis of a request made by the home builder. No changes can be made to the design during construction without the consent of the municipal building commission and the design engineer. During the inspection, the building commission examines whether the building was constructed according to the design documentation approved in the construction permit and within the conditions set in the land use decision and construction permit. Our customers can find in the “Customer Service” section sample application forms for a land use decision, construction permit and certificate of occupancy as well as other forms.